Arrive at Alghero via the international airport in the morning. Drop your belongings off at your stunning holiday villa in Sardinia and take a look around your home-away-from-home. Spend some time unwinding in the abode; you’ll need it after the early start to get there! By the time that lunchtime rolls around, we suggest heading into the city to grab a bite to eat and explore the area. A walk around this historic treasure will showcase the charm that encourages tourists back, time and time again. Character is plentiful here, with the blend of new and old architecture that make up a colourful tapestry of buildings. The Catalan Gothic buildings here include the iconic Roman Catholic cathedral ‘Cattedrale di Santa Maria’, as well as the Chiesa San Michele church with its brightly-tiled dome. The city was once a military base, with bastions and towers dotted around the area that were originally used to defend the city from attack. 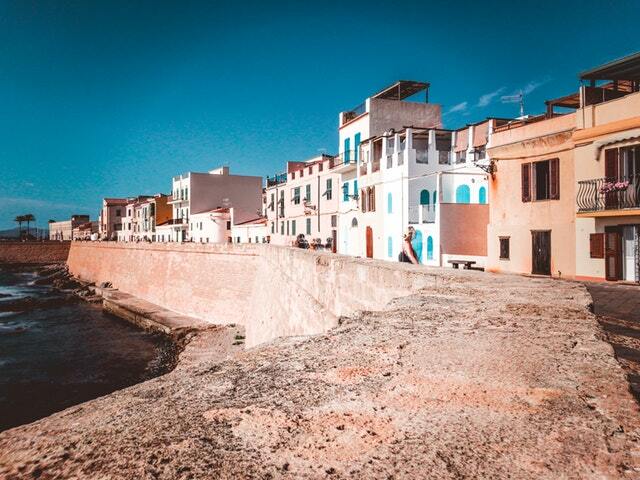 Now, these are stunning examples of Alghero’s intriguing past. Walk along the promenade on the water’s edge to experience where chic culture meets note-worthy nature. Talking of nature, inside the Museo del Corallo di Alghero, you can see a collection of red coral displays. In the evening, enjoy a colourful sunset from the Blau Sky Bar, with panoramic views across the city and to the ocean beyond. This restaurant is based on the ninth floor of a hotel complex, allowing you to marvel at the scenery from the highest viewing spot in the whole city. All the while, sipping on a glass of local wine. Just be sure to book your table in advance, the place can book up quickly in peak season. After a wonderful evening, head back to your peaceful and private holiday villa to rest up for tomorrow’s fun-packed day. 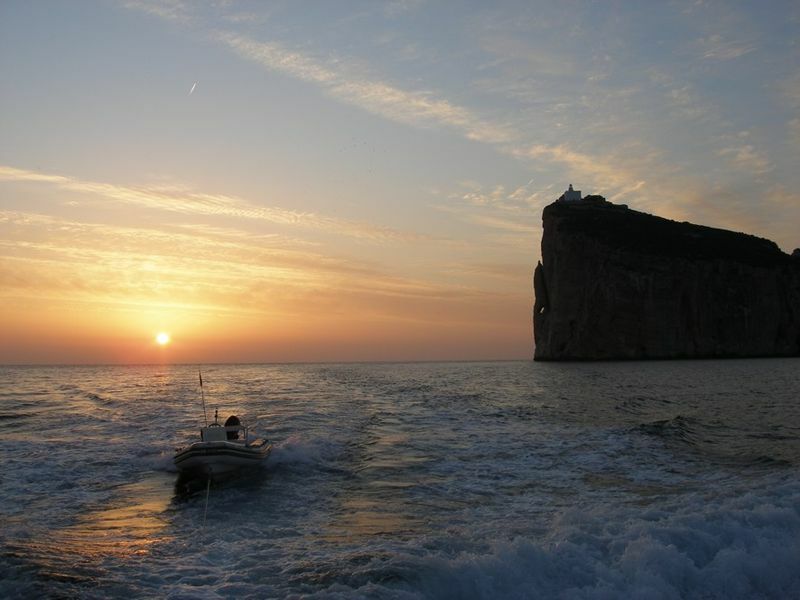 West of Alghero are the limestone cliffs of Capo Caccia, under which Neptune’s Grotto lies. 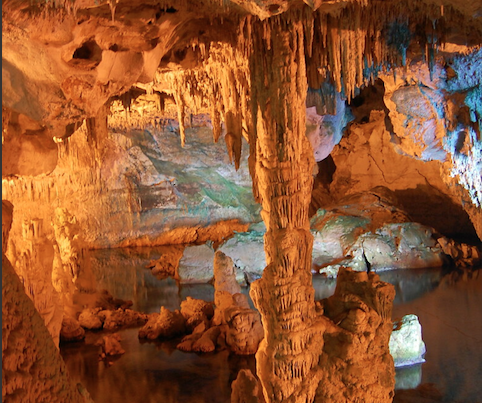 Originally discovered by fishermen in the 18th-century, Neptune’s Marine Caves, a name they often go by, are arguably the most famous caves in the whole of Europe, mainly due to their size and beauty. The spectacle of these dramatically-lit cave halls, shaped by geological forces, is impressive, so much so that they are of great scientific interest. Make sure to spend the whole day here, so you get to enjoy the tiny cove of Cala Dragunara with a dip in Sardinia’s iconic crystal waters. 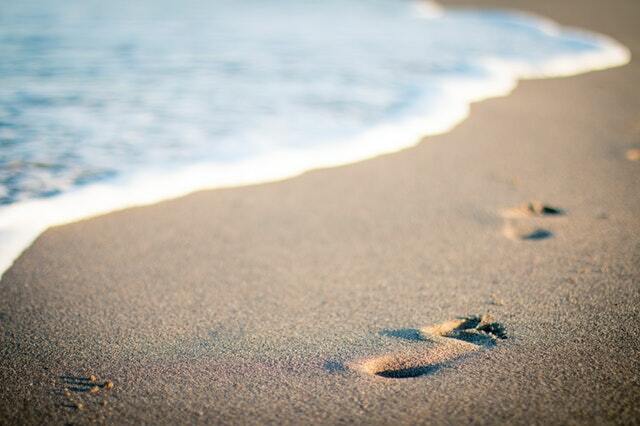 The bay is made up of fine golden sand that feels nice between the toes. You can arrange to be a part of a small group taking a day trip to the caves and cove via boat. Starting and dropping-off points are typically at Alghero’s harbour, although check with your tour operator to confirm details. When you return, head to one of the many city’s restaurants to replenish after a busy day. Alghero has a host of fabulous treats, from their famous rock lobsters, fresh fish and seafood to its locally produced salami and pecorino. If you’re looking for a must-try local dish, Malloreddus is the typical Sardinian pasta dish, made up of sausage in a rich tomato sauce. Sunday’s were made for relaxing, so head to La Bombarde beach. Here the sands are gold and the ocean is clear, with plenty of sunbeds to rent! The scenery around the beach is just as gorgeous as the beach itself, made up of volcanic rocks and a dense forest of Mediterranean flora. Located around the beach are a host of restaurants and bars where you can quench your thirst. You can either drive to the beach, with ample parking areas adjacent or jump on the shuttle bus service to make your way there from the city. Just note, the beach can get busy during the summer season. • Lazzaretto Beach: Close to Bombarde Beach, it’s known for the bright but icy waters that are refreshing on a hot day. Its name derives from the tower that overlooks the rocky beach. • Punta Negra Beach: A small bay close to Fertilia. A generally quieter beach for relaxing, although a big hotel complex overlooks it. • Mugoni Beach: One of the largest beaches in proximity to Alghero. The water is shallow and fresh, making it ideal for families. Behind, a large pine forest fringes the beach. • Porto Ferro Beach: Again, a sizeable beach within Alghero. 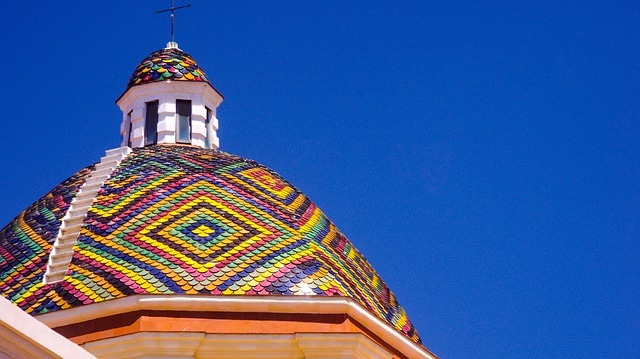 Although, this one sits on the border between the city and Sassari. This beach is known for its large, reddish dunes that dominate the landscape. The beach is a wind-trap making this place favourable with surfers. Please be warned that the last stretch of the beach is allocated for nudists. • Maria Pia Beach: White dunes meet Mediterranean shrubs at the Maria Pia Beach. The water is pleasant and clear, making it a preferable place to relax. Located just a short distance from the city. • Lido Novelli and Lido San Giovanni Beaches: In the heart of the city, these beaches are practically located, making them excellent choices for anyone who doesn’t want to trek outside of the city walls. However, this beach can get very busy, so head out early to secure a spot. A favourable beach for families with plenty of facilities for all. • Poglina Beach: Not far from the mountain village of Villanova Monteleone to the south of Alghero. It’s a cobblestone beach with beautiful amber sand. This beach is known to get windy which means surfers often go here to practice their sport. After a weekend of fun, sun and sightseeing, it’s time to make your way home. Alghero will wait for your next return, as we are sure you’ll want to come back and see all the things you missed on your weekend break! For more information on Alghero or the best weekend breaks in Italy for you, be sure to get in touch with our holiday advisors. We’ve been helping people embark on their dream villa holidays in Italy for years, offering every customer advice on how to personalise their Italian escapes with Essential Italy. We’d love to help you too so don’t hesitate to get in touch today!